September 25, 2018 — WaterLinks and the United Nations Educational, Scientific and Cultural Organization (UNESCO) International Hydrological Programme (IHP) held the WaterLinks Forum 2018 at the Unilab Bayanihan Center, Pasig Metro Manila on September 25 to 27, 2018. 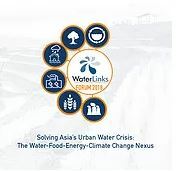 The theme for this forum is “Solving Asia’s Urban Water Crisis: The Water-Food-Energy-Climate Change Nexus”. The Forum gathered over 200 participants composed of water operators, industry leaders, sector professionals, and policy makers from various countries. The trade exhibition also demonstrated some of the latest technologies in water and wastewater management. As part of the Forum, a “Megacities, Water, and Climate Change” seminar was held on its first day at the MK Tan Hall. The Philippine School of Business Administration – Manila Disaster Risk Management (DRM) Unit was invited to observe in this seminar via its DRM E-Learning Coordinator, Mr. Ramon Iñigo M. Espinosa. The following is a report of the seminar by the Coordinator. The “Megacities, Water, and Climate Change” seminar began with welcome remarks from Ms. Bianca Jimenez-Cisneros, Director of the Division of Water Sciences frm UNESCO, France via a video message. Then, the Mr. Arjun Thapan, Chairman of WaterLinks, discussed about “The Range and Scale of Megacities’ Water Vulnerabilities”. He discussed the importance of megacities and its problems for water security. He shares that 1/3 to 1/2 are slums, some megacities are sinking, and water demand often outweighs supply. He shares that in Delhi and Dhaka, “water mafia” exists which forces citizens of megacities to buy stolen water due to acute water shortage. He presented that 85-100 cities are at risk of flooding and provided possible solutions with regards to planning, costing, and capacity building. Three case studies were presented from different megacities regarding their water sufficiency and security. Ms. Neeta Pokhrel, Principal Urban Development Specialist from the Asian Development Bank (ADB), India presented the case study of Kolkata, India, capital of West Bengal and bordered by four different states. While the city is “highly blessed” with water, she shared the water security problems such as being in a low sea level,, arsenic problems, and vulnerability to natural disasters. She also discussed that its 300-year old water systems can only supply 5-6 hours of water a day with an estimated 63 million liter loss per day. She presented a 20-year project by ADB to support the city, such as modernization, environmental waste solutions, and planning especially for sewage. Mr. Romeo Roderos, Department Administrator for Innovation and Technology of the Metropolitan Waterworks and Sewerage System (MWSS), on behalf of Mr. Reynaldo Velasco, Administrator of MWSS presented the case study of Manila. He begins by sharing that the Philippines has a National Water Security Index of 40.4 out of 100. He also shares that there had been no new water infrastructure for 30 years until Pres. Rodrigo Duterte started approving the various water infrastructure projects such as the Angat Water Security Projects. These include the Angat Dam Rehabilitation, Bayabas Dam Project, and Candaba Multi-Purpose Impounding Dam. These projects can be completed in 3-5 years and aims for building sustainable watersheds. He shares that private-public partnership is good for coverage and there is a challenge in sewerage systems for the Philippines. Dr. Cha Donghoon, Director of the Seoul Water Institute, Korea, shares the case of Seoul. He shares the present and future challenges on Seoul waterworks. He presents “ARISU”, the Seoul water system, which is the old name of the Han River and how it managed to give 100% water supply coverage. He shares some challenges including the rising temparature in the last 15 years, leading to low precipitation and drought in 2014-2015. He also shared the need to replace pipes with new materials and using gravity flow by building reservoirs in different elevations. He shared technologies used such as the real-time management with an integrated information center and various renewable energy projects. Finally, while the case for Seoul is excellent, he shares that there is a need to secure a more stable water supply. After a short coffee break, Mr. Alexandros Makarigakis, Programme Specialist of the Water for Human Settlements, Natural Sciences Sector, UNESCO, discussed the importance of establishing a regional alliance, including its costs and benefits. He shares the upcoming EauMega Conference in Paris on October 2019 as part of establishing this alliance among megacities in order to attain water security. Finally, Ms. Carolin Chal of the Paris Solid Waste department explained the importance of solid waste management in water security. She discusses how it’s never a subject in international forums yet how important it is in water security. She discusses the need to make a link and the need to think about solutions together with water security. She discusses the various technology available, such as waste to energy, and the challenges, since local application can be different from megacity to megacity.